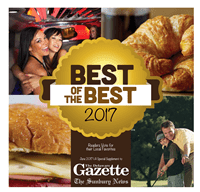 The Barn at Stratford and the Delaware County Historical Society are honored by the Readers’ of the Delaware Gazette voting us a winning Banquet/Reception Facility. Venue Manager, Connie Hoffman and her team have worked hard to make every event an historic and memorable event. Thank you for recognizing their efforts. The Garth Oberlander Barn was erected in1848 by George Bieber. The stone-end bank barn was built two stories tall and the main portion measures 84′ by 36′. The foundation and stone end walls were are squared and coursed limestone rubble from the plentiful deposits of limestone at by the nearby Olentangy River. The massive timber structural elements, many of which can easily be seen from inside the barn, are the hand-hewn products of the first-growth surrounding forest. This historic barn is now owned by The Delaware County Historical Society and operated at The Barn at Stratford. This beautiful historic barn is now available for your wedding, organization, or family event. The Delaware County Historical Society is a nonprofit institution. It receives monetary support from the community for its facilities and collections and for its educational and historic preservation efforts. The facilities and collections are among the most valuable assets of the Delaware County community. The Society holds and utilizes these unique structures and treasures for the education and enjoyment of the public. Our mission is to promote and sustain interest in the history of Delaware County, Ohio through historical preservation and education.